David Benton has made his work at The Rittenhouse his true passion and he lives and works sincerely by those well-spoken words. He is often seen adjacent to the front desk during particularly heavy check-in days, staffing his champagne station and greeting the incoming guests with a fluted glass of bubbly and a cheerful Welcome to our home. It doesnt surprise the staff to see the great lengths he would go to in order to satisfy any special requests and Mr. Benton empowers his team members to do the same while leading by example. An illustration of Pastry Chef Fred Ortega exceptional abilities came to us in the form of a welcoming display in our rooms of white and dark chocolate covered tuxedo-clad strawberries on a tray made to resemble our coveted Seven Stars and Stripes Award plaque that had been presented to The Rittenhouse the previous year. We entered Chef Freds chocolate making domain and couldnt help but notice his high-tech chocolate conveyor belt, the mechanical centerpiece unit that makes all his fanciful ideas a reality. 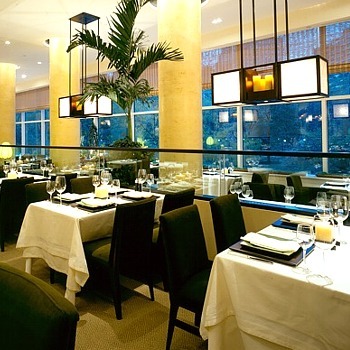 There are possibilities of choosing three to six courses when dining on the Lacroix tasting menu with the appropriate wines that the Sommelier selects to accompany each course. There is also the possibility to dine at the Chefs Table directly under the lights in the magnificent show-kitchen. Be sure to reserve in advance as this feature puts you right in the midst of things and has all the spin of a reality show in the making. I started my meal off with Sardine fish balls on a bed of mixed greens with cherry tomatoes and a fine, aromatic balsamic vinaigrette. I'm a lover of fishcakes, and this was the first time a had one made entirely of Sardines, with very little bread and egg to hold, it was delicious. I focused my attention now on a pretty plate of homemade Ricotta Ravioli with a most aromatic Trapanese Pesto sauce. This dish, a little on the heavier side, was selected as a second appetizer and each bite was melting with a creamy, delicate flavor as I added little pieces of the fresh Basil. Fabulous from the first to the last bite, this was a home-run! Executive Chef Salvatore Barbara, who after traveling the world for over a decade, returned to his native Sicily, works with fresh, local, organic produce. 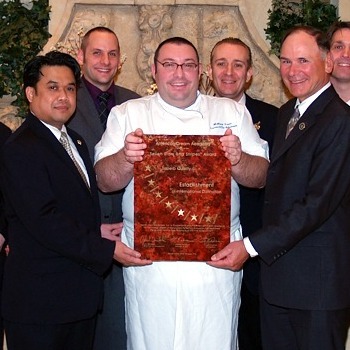 Barbera studied with Paul Bocuse in Lyon, France, and has worked in Abu Dhabi and Asia, an influence that is felt in his style. By now, dessert was an almost daunting task, with a little too much of the butter biscuits; the Pistachio ice cream was everything what you should expect and more in flavor. 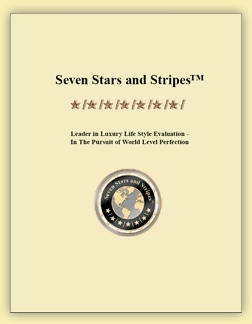 Dear traveling friends all over the world, with spring already here we are now taking recommendations for your favorite luxury resorts, hotels, spas and restaurants to be considered for the distinguished Seven Stars and Stripes® Award 2008. 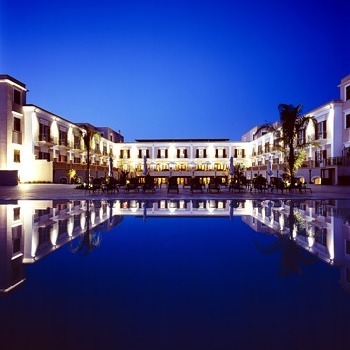 In this issue we are introducing a relatively new edition to the famous global Kemipinski brand in Sicily, Italy; the Hotel & Spa Giardino di Costanza. 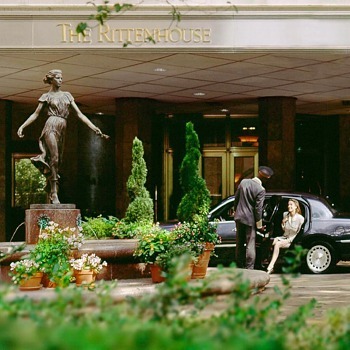 We have also reviewed the ever-young and ever-exciting Rittenhouse in Philadelphia, USA recently for 2007. We attended a meeting of the Luxury Marketing Council in NYC last month and met with Greg Furman Founder & Chairman of the successful global organization. Congratulations to the newly launched chapter in Dubai, UAE! On May 1st Seven Stars and Stripes is presenting an all-inclusive golf vacation for two at one of the most celebrated fundraisers of NYC at Cipriani Wall Street, supporting Schneider Children's Hospital, one of the top pediatric facilities in the US. One of the US TV's brightest stars, Ray Romano, of the show Everybody Loves Raymond, will be MC-ing the elegant affair. 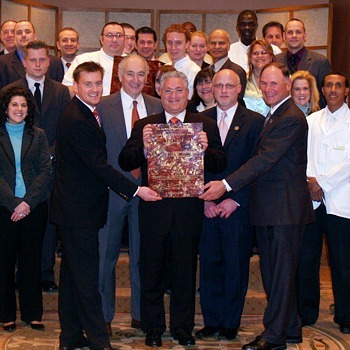 The lucky winners will travel to a Seven Stars and Stripes 2007 award recipient all-inclusive Fairplay Golf Hotel & Spa in Andalusia, Spain. 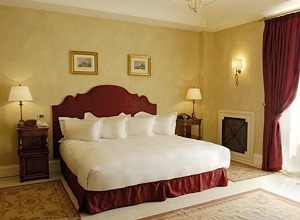 The amazing Presidential Suite for five nights is awaiting the fortunate couple. 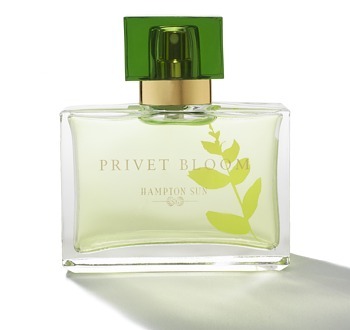 A complete line of luxury sun-tanning products by Hamptons Sun, inspired by the beautiful beaches of eastern Long Island, New York will travel with the winners to Andalusia and so will their amazing new fragrance Privet Bloom - that will soon conquer the world. 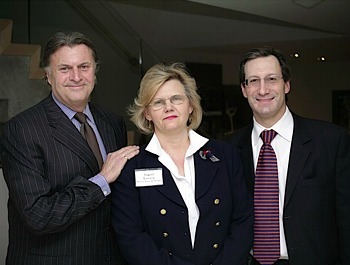 Left to right: Greg Furman, Founder & Chairman of the Luxury Marketing Council Inc. - Ingrid Lemme, Chairperson of Seven Stars and Stripes® and Host of the American Dream® TV Show - Nathan Devore, Co-President of Rich Worldwide Travel. 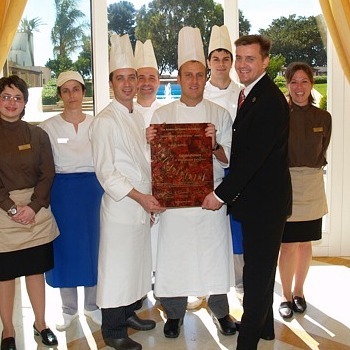 The service was clearly Kempinski inspired; freshly picked exotic fruits, sparkling wines and delicious petite fours. 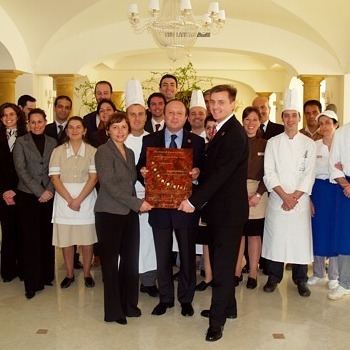 General Manager Paolo Sanavia has accomplished the training of his staff to the extraordinary global service level. Mr. Savania has worked in hospitality management all over the world and as a true visionary he is now in the process of fine-tuning a 27-hole golf course and he is adding medical facilities to the already existing distinguished spa facilities. 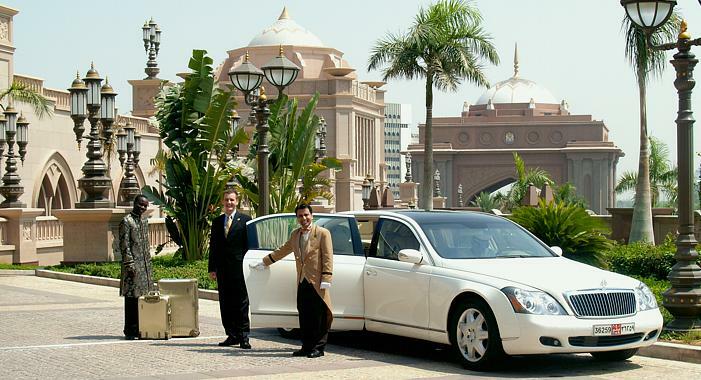 * Pictured at Emirates Palace - U.A.E.